While it is important and useful to sort and store toys according to type, it's important not to go overboard. A single, open container is often the best solution for sorting. Resist the urge to divide things further. Sorting all the Legos® by size and color may make perfect sense to an adult brain. After all, it’s easier to find the right piece if they’re organized this way, right? I guarantee you it won’t make any sense to a six-year-old. For him or her part of the fun is in the finding. And putting them all back into those little slots is way too much work! The easier you can make it for your child to put things away, the more likely your child will do so without a fight. 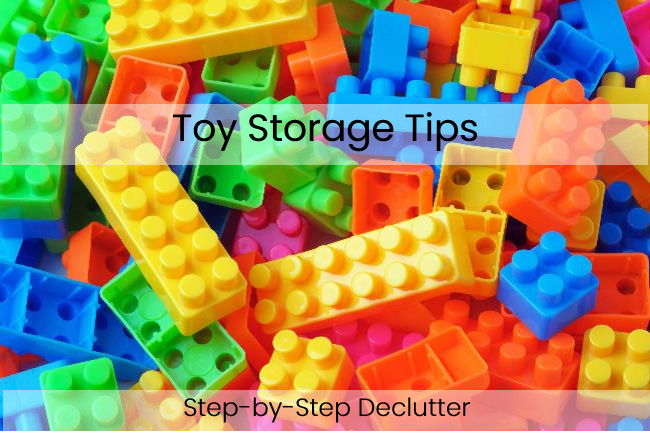 Look for toy storage solutions that make it simple for kids to find what they’re looking for and simple for them to put their toys away when they are finished with them. Choose open storage containers whenever possible – By eliminating lids, you and your kids have one less thing to keep track off. In addition, you eliminate a step in the clean-up process! When using closed containers for toy storage choose containers that are easy for little fingers to manipulate. The simplest containers have lids that simply set on top. If you prefer a lid that somehow hooks in place, snap lock or sliding lock lids are generally much easier than the older style lids that wrap around the ends of the box and click in place. Also look for clear containers so that the contents are visible. Inexpensive plastic drawers on wheels make great toy storage containers. They're easy to open and close. They're see-though so kids' can tell what goes where and find what they're looking for. There is no lid to get lost or broken, and they come on wheels so they're easy to move around! 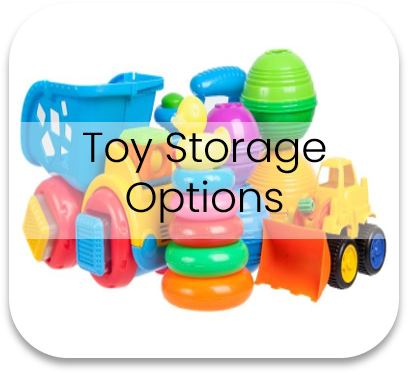 Your children are going to outgrow many of their toys over time, but good storage containers will remain functional indefinitely. The goal is to make your children as self-sufficient as possible when it comes to caring for their stuff and keeping their room clean. You do this by making it as easy as possible for them. Save the high shelves for the stuff that requires adult supervision. While most plastic storage boxes are designed to stack easily on top of one another, doing so in a child’s room can be counter-productive. Stacks of containers are burdensome and difficult, if not impossible, for children to manipulate. Without fail, the container on the bottom is the one your child will want, making it necessary to move all the other containers in order to access it. If you must stack due to space constraints, try to limit stacks to no more than three high (preferably two). Remember to keep it simple and set your child up for success. Labels make it easy for your kids (and their friends) to remember which toys go in which container, thereby making it easier for kids to put their toys away. For pre-readers, create labels using a picture of each type of toy. For older children, pair the picture with words. They drop them. Then throw things into them at high velocity. They empty them out and use them for target practice for everything from bean bags to dart guns. They step on them. Sometimes they even stand or sit on/in them. Toy storage containers need to be able to withstand a lot of love (a.k.a. abuse). Don't settle for cheep. You won't save money if you have to keep replacing the container. Choose durable options. When selecting toy storage for your kids’ rooms, try to look at the space from their perspective. Options that are durable, versatile, and functional will best meet the needs of both children and parents. By setting your kids up for success, you make it easier for them to do what you want – keep their rooms clean. 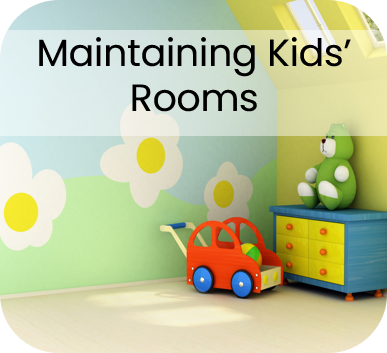 Click on the images below to read more about organizing and maintaining kids' rooms. If you found this page helpful, please share it with other parents on social media. Also, leave me a comment below. I would love to hear from you!